Turkish President Tayyip Erdogan has stated that in the event of another airspace violation, Ankara will respond in the same way as it did with the Russian warplane. He added that the downing of the Russian bomber was an “automatic reaction” in line with a standing order given to country’s military, while the Kremlin’s reaction was “emotional and unfitting of politicians”. Earlier, on Thursday Russia’s President Vladimir Putin said that there were “certain countries that covered and continue to cover terrorists”. Putin also stressed that Ankara’s recent actions were completely unexplainable, adding that the Turkish government seems to be deliberately pushing relations between the countries into a deadlock. Following President Putin’s statement, Russia’s Prime Minister Dmitry Medvedev announced that Moscow will respond with diplomatic and military measures over the Su-24 incident. In particular, he noted that Moscow is considering the introduction of bans on the activities of Turkish companies’ in Russia. President Erdogan’s imperial ambitions are reflected in Turkey’s new presidential palace. Bigger than the White House, Buckingham Palace and the Kremlin it boasts over 1,000 rooms. 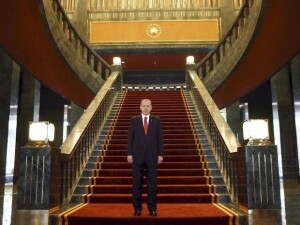 See ‘Erodogan’s new $350 mln presidential palace draws controversy” (linked).